As the World Cup recedes into the distance and the new domestic football season gets underway, now is a good time to reassess the link between football and economic performance. The analysis here provides an update to some work carried out initially around ten years ago – with some surprising new results. The influence of money on football grows ever stronger. We now hear about nine figure transfer fees, and top players are earning in a week what many people could expect to earn in a decade. The link between money and performance is generally accepted; although some teams may under or over-perform for short periods, in the long run playing budgets is a very good indicator of success. My original hypothesis from ten years ago was that, as England’s population and wealth moved south, we should expect the performance of football teams in the south to improve accordingly. If teams in the south could raise attendances and sell more merchandise, then higher budgets should gradually increase their budgets. And most importantly, it could point to future success for our local team Cambridge United. The football league tables provide a unique measure of relative performance with which to carry out an assessment. No need to correct for inflation, or fluctuations in the wider economy. Since 1958 there have been 92 league teams, with only one winner in the top division and one team finishing bottom of the fourth tier (currently called League Two). The number of teams in each league has changed but at the end of each season there is a ladder of 92 teams. Each team is assigned GPS coordinates based on its current or last home stadium (Wimbledon and MK Dons are treated as separate teams). I then take an average of teams’ locations, weighted by final league position (1st in top league = 92, bottom of fourth tier = 1). The result is the country’s ‘football centre’. If my hypothesis was correct, England’s football centre would be gradually moving towards London which, like the road signs, I have defined as Charing Cross station. And the results show that for about 30 years up to the end of the 1980s this is indeed what happened (Figure 2*). 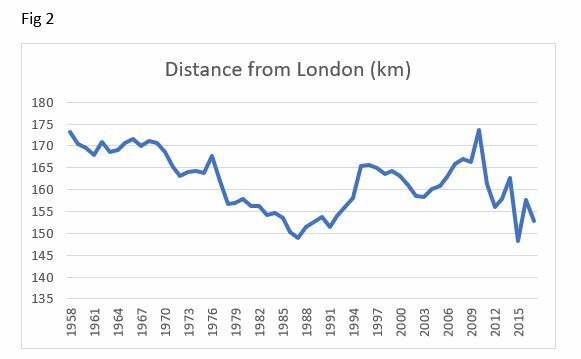 There was a consistent shift in the football centre towards London, with the distance becoming 15% less over 30 years (a reduction of nearly 20 km). In fact, if we only consider distance north from London (i.e. ignore east-west) then the distance becomes 20% less. The pattern is the same across other leagues. Why does this trend stop around 1990 – and even reverse around half of the reduction? One possible reason is the importance of television money in football, which started to take off around this time. Money from TV rights is split between teams according to current success so could be a way of preserving the status quo (and possibly a leaning towards more ‘traditional’ teams in the north). Think for example about the difference between the Premier League and Championship, parachute payments, etc. Although the charts can only show correlation and not causation, it could be argued that teams in the north benefited disproportionately from the TV deals. The importance of TV money is highlighted today in a BBC article by Andrew Aloia. 2008-2018 – could the changing fortunes of the Northern teams reflect government spending? Turning to the past ten years, in the new results I was expecting to see a broadly similar picture – TV money has only increased in this time. However, this has not been the case. First, patterns seem to be much less predictable, which could relate to financial stresses that have pushed some clubs up and (mostly) down divisions. But more noticeably, by around 2010 the football centre was back to where it was in 1958 before apparently falling back to 1990 levels in less than ten years. It is difficult to miss the similarity to patterns in government spending. In the period leading up to the financial crisis in 2008-09, government spending was rising and so were the fortunes of teams in the north. Immediately after the crisis, as the government implemented its stimulus package, teams in the north still did well. But after that, as the Conservative governments cut government spending in the name of ‘austerity’, the balance of power in football has moved south rapidly. Again, it should be stressed that the charts show correlation and not causation, but the evidence is quite compelling. We know that government expenditure makes up a larger share of the economy in northern regions, and that spending on football (either tickets or merchandise) could be one of the first things to be cut in times of difficulty. Although TV money is still important to clubs in all four divisions, sooner or later loss of local support could be expected to feed through to playing budgets and, ultimately, success on the pitch. So what can we expect from this season? At the top of the Premier League, the performance of local economies has limited impact. These teams generate support (and financing) from across the country and abroad. In the lower leagues though, it could be more of the same. Austerity is not as severe as it once was but do not expect public expenditure to grow rapidly. There is the potential for Brexit to cause major disruption to trade, which could again affect the north disproportionately. And there could of course be other shocks in an increasingly uncertain global economy. Budgets for this season have already been set so changes will not be felt immediately. But it is difficult to see a change in the current long-term trends. 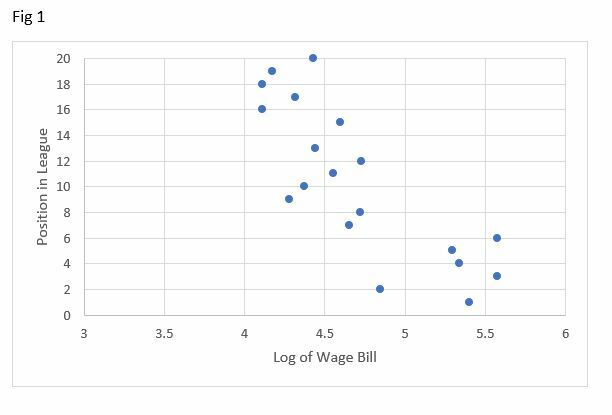 Premier League wage bill as reported by the Guardian, original data from Companies House. Maps showing the position of every football ground in England by Community Walks. Football league table results and statistics by league321.com – full recognition and acknowledgement is made to the work of the many contributors at the Rec.Sport.Soccer Statistics Foundation who catalogue the league tables.